Conditional LOVE v Unconditional LOVE. Codependency is a dis-ease of self. It is a specific condition characterized by preoccupation and extreme dependence on another person ( emotionally, financially, socially, sometimes physically ), or on a substance ( such as alcohol, drugs, nicotine and sugar ), or on a behavior ( such as workaholism, constant controlling, gambling, serial romance, chronic fixing of others, compulsive sexual acting out or choosing victimhood ). This dependence, nurtured over a long period of time, becomes a pathological condition that affects the co-dependent in all other relationships around them. 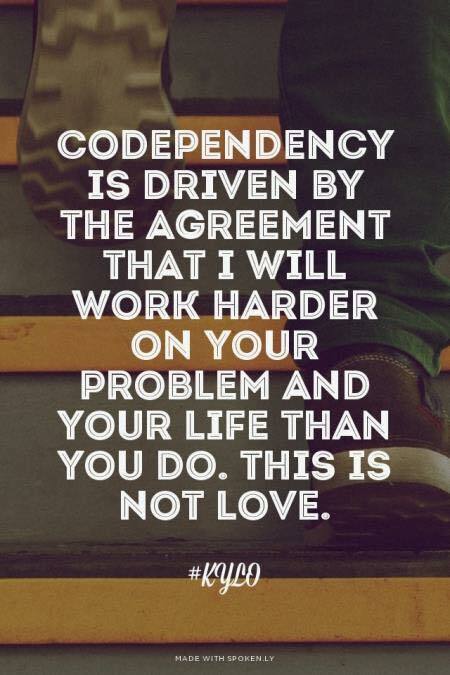 Over-caring, over-protecting, rescuing, fixing and compulsive helping are all components of Codependency and you don’t need to be around alcohol or drugs to express it. Being addicted to fear, scarcity, shame & guilt is enough. Learning to give to yourself the devotion you give to others is a starting point of wellness and self confidence.